"Let the past die. Kill it, if you have to." WARNING: The following contains spoilers. I've already said quite a bit about Star Wars: The Last Jedi in my original review, but a second viewing today brought up some fresh thoughts. If The Force Awakens was about reliving the past, The Last Jedi is more concerned with moving on into a brave new world. Yet, just as its characters discover, one must learn from the past in order to move forward. It isn't so much about wiping the past away, as many of its detractors have contended (that is the ultimate plan of Kylo Ren), as it is about leaving the past in the past in order to create a new future (represented by Rey's quest to rebuild a new Jedi order, unencumbered by dogma). Whereas J.J. Abrams created pointless "mystery boxes" to leave the audience guessing, Rian Johnson understands that these were distractions from what made Star Wars great in the first place. By revealing that Rey's parents were, in fact, nobodies, Johnson subverts expectations created by franchise history and shatters the idea that the Force is some mythic power accessible to only a chosen few. It does not belong to the Skywalkers, or to an elite group chosen by gatekeepers with a poor track record of success (Jedi arrogance lead to the dissolution of the Republic and the rise of Darth Vader), it belongs to everyone, to the common people. Had Rey turned out to be a Skywalker, or a Kenobi, or a Solo, it wouldn't have been a surprise, merely something the fans expected all along. Giving us what we've come to expect doesn't make for a satisfying narrative. The same goes for Snoke; it may well be that we learn more about his rise in Episode IX, but we know all we need to know about the character for this particular story. 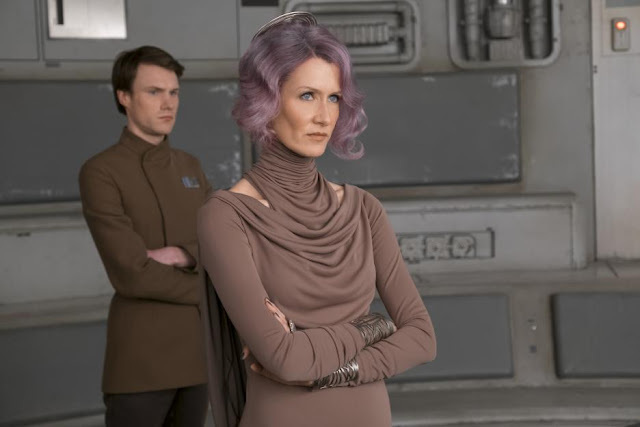 I was also incredibly impressed with its sexual politics - Poe Dameron might be in the running for cinema's most egregious mansplainer, but Laura Dern's Vice Admiral Holdo shuts it down with such aplomb. She's easily my favorite new character in the series, and Dern is absolutely terrific here. I especially love how Johnson subverts audience expectations of the character - she has purple hair and wears long flowing gowns, but she is a strong, steely presence who owes no one an explanation about her actions. She takes charge, and does what's best. Holdo didn't join the Resistance to make friends, she's there to save lives, and she isn't about to let a hotshot pilot second guess her leadership. It is also a film with a deep understanding of its place in pop culture. 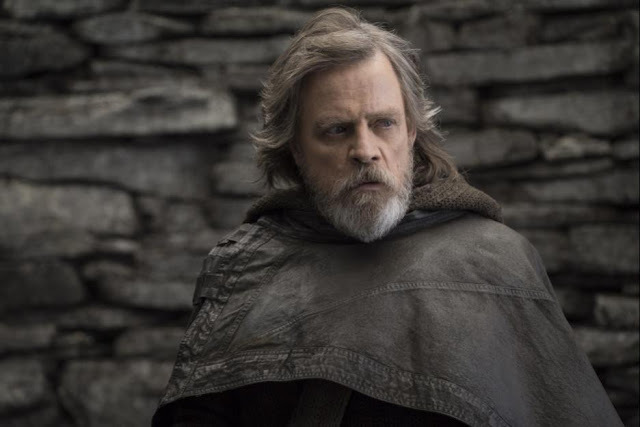 Luke is keenly aware of his status as a legend, and it is that status that leads him to believe that he is, in fact, harming the galaxy because he cannot possibly live up to his own mythic persona. The Last Jedi contends with this complicated idea of myth, and how a lie can take on a life of its own and ultimately disappoint those who choose to embrace it. And yet, the keystone here is hope; the film's final scene poignantly demonstrating not only the power of Luke's ultimate sacrifice and the galactic impact of his legend, but the position of Star Wars itself as an inspiration for generations of young people. It's a profoundly self-aware rumination on its own power, and I'll contend that The Last Jedi is perhaps the most emotionally satisfying entry in the Star Wars saga. Like The Empire Strikes Back before it, it undercuts audience expectations (Empire famously started off with a climactic battle and ended with something more personal), leaving us adrift in a world where anything can happen, with no roadmap for which to predict where we go from here. It's not interested in giving us what we want, instead it's giving us something we never knew we needed. Johnson understands that to save Star Wars, he must destroy it, as Luke understood that to save the Jedi, he must likewise burn it all down. The Last Jedi starts from scratch, honoring the past while racing untethered into the future. It also offers a glimmer of hope for a world where the spark has seemingly gone out. "That's how we're gonna win," Rose says at one point, "not fighting what we hate, but saving what we love." It is an answer, and indeed an antidote, to the relentless darkness and negativity with which we find ourselves in a daily basis. It is that sense of love that sets it apart, fighting for something rather than against something. It is ironic that the film has stirred up so much negativity among fans, when built into its very thematic core is the idea that time is better spent supporting the things you love than tearing down things you hate. Star Wars is at its best when it has a vision, and Johnson gives us a thrilling, moving, and awe-inspiring vision of a future of endless possibility, blasting the galaxy wide open. It's the most essential, and most satisfying, Star Wars film in decades, reminding us all what made it such a cultural touchstone in the first place. It feels fresh, recapturing the magic without replaying what we've already seen. For the first time since the original trilogy, we truly don't know where this is going, and it's a thrilling feeling indeed. It made me feel something I haven't felt from a Star Wars film in many years - awe. Pure, childlike, unadulterated awe.